Alex is a Geology major attending California University of Pennsylvania, originally from Bunola, PA. Coming from rural Southwestern PA, she has seen both the positive and negative impacts of resource extraction in our area. Alex is excited to intern with CCJ to learn about community advocacy and educational outreach, but she’s most excited to spend time hiking and monitoring the streams within Ryerson. She hopes to take her experience at CCJ with her in her career as a geologist, with long term goals working for a state or federal regulatory agency. When Alex has free time she prefers to draw or knit usually while hanging out with her veiled chameleon buddy, Bowen. Nick Hood recently joined our staff as the community organizer. You may recognize Nick from his work as an intern at CCJ. Nick and his family have lived, worked and recreated in Washington County for their entire lives. Currently, he is enrolled at the University of Pittsburgh and is finishing his degree in Environmental Studies. Nick is passionate about the environment and hopes to see an increase in environmental protection to help ensure the health and well-being of his family, including his 4 nephews and 1 niece. As a part of his goals, he aims to educate and provide the community with the necessary knowledge and tools to combat pollution and corruption perpetrated by the large energy companies. When he is not working, he likes to play music, watch baseball and spend time with his family and friends. In addition, Sarah Martik has moved into the position of Campaign Coordinator. She will continue working with our members and residents in Washington and Greene Counties but will be focusing on how people can get engaged in our campaigns across the region. Meet Our Summer Interns: Nick and Maura! Please welcome the newest additions to the CCJ team: Nick and Maura! Nick and his family have resided and worked within Washington County for their entire lives. Currently, he is enrolled at the University of Pittsburgh and is finishing his degree in Environmental Studies. Nick is passionate about the environment and hopes to see an increase in environmental protection to help ensure the health and well-being of his family, including his 4 nephews and 1 niece. As a part of his goals, he aims to educate and provide his community with the necessary knowledge and tools to combat pollution and corruption perpetuated by the large energy companies. When he is not working, he likes to play music, watch baseball and spend time with his family and friends. Maura also studies at the University of Pittsburgh where she majors in environmental science. She lives with her family just south of Pittsburgh in the Borough of Carnegie where she enjoys baking, reading, and gardening. Maura believes the success of big business should not come at the cost of a community’s well being and is excited to be part of CCJ,where she hopes to get to know the coalfields and the people who live in them. Nick and Maura are both are eager to work with our members and supporters as our summer organizing interns, so if you see them around this summer, be sure to say hi! Sarah Grguras, who interned with CCJ last summer, is now a junior at the University of Pittsburgh dual-majoring in environmental studies and ecology. Sarah has continued to stay in close contact with CCJ. 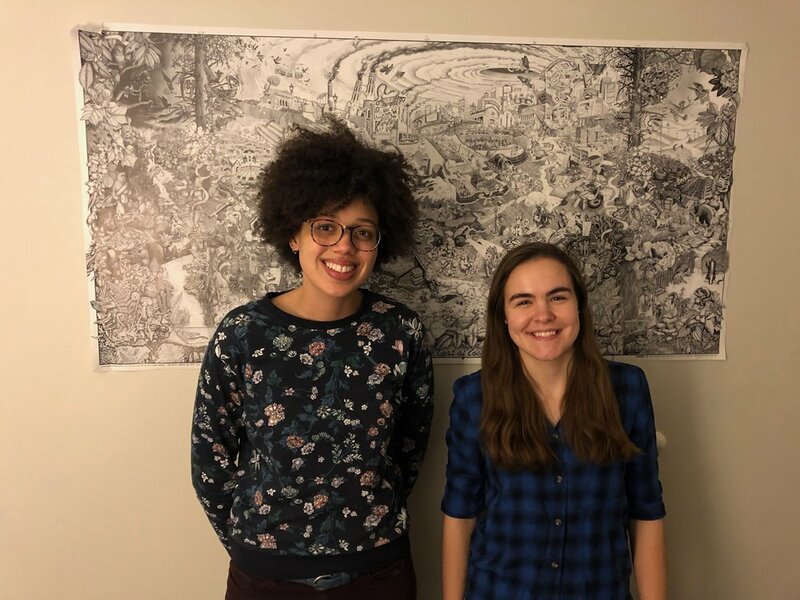 She has also continued to stay heavily involved in the environmental club on Pitt's campus, such as Free the Planet and the Fossil Fuel Divestment Campaign. This summer she is working for Citiparks on their roving art cart as a way to get to know Pittsburgh, its parks, and the community better. She is also working for Clean Water Action as a phone canvasser and has been calling on the issue of the Clean Water Rule. In addition to those two jobs, she is also working as the Sustainability Program Assistant, which helps to create sustainable environmental change at the University of Pittsburgh. In-between these 3 jobs, Sarah will be doing research for CCJ as our research fellow, focusing heavily on a virtual Frontline Community Tour project and its effects on student activism by comparing surveys before and after this virtual tour, and before and after an in-person tour. Sarah is excited to strengthen her relationship with CCJ through this research project. Please join us in welcoming our new summer organizing intern, Emma Washa! Emma is a student at the University of Pittsburgh studying Communications and Political Science. Along with gardening, cooking, and spending time with her friends and family, her passions lie in environmental justice and community outreach. Upon participating in a CCJ Frontline Community Tour in 2015, Emma became inspired to become more involved in environmental organizations at Pitt, and is now excited to continue her work in Western PA to advocate for community empowerment in the communities directly impacted by fossil fuel extraction. During her time with CCJ, Emma hopes to learn more about how she can act as a resource to communities who are resisting the fossil fuel industry. Please join us in welcoming our new community organizer, Sarah Martik. Sarah is a bilingual theatre-enthusiast from Coal Center, PA, where she was born and raised along with her four sisters and brother. In the past, Sarah has worked as a course instructor at the Mon Valley Performing Arts Academy, as the Children’s Theatre Manager at Boston Ballet, and as an English as a Foreign Language instructor for Education First. She has also assisted on numerous campaigns at both the local and national levels. Her goals as a community organizer include expanding our organization’s outreach to include more people who are so deeply impacted by environmental injustices, fostering new and stronger relationships with other non-profits in the area, and supporting community led initiatives that diversify our local economy. When you meet Sarah, don’t be surprised when she shows you pictures of her fur-niece, Willow (her sister’s lab mix). I am writing to let you know that I am leaving my position as Executive Director at CCJ. I am incredibly proud of the work that we have accomplished over the last 5 years. Together, we have built power and amplified the voices of this community on issues around fossil fuel extraction and use in southwestern PA. I leave now knowing that we are strong, and that we will win. Leading the Center for Coalfield Justice has been among the greatest privileges of my life. It has been a true honor, and I thank you all for your time, dedication, and support. I am thrilled to announce that starting next week, Veronica Coptis will be our new Executive Director. I cannot think of anyone better positioned to lead CCJ, and I know you will all continue to do work to improve the quality of life for present and future residents of our region. I have accepted a job as Senior Campaign Representative for the Beyond Coal campaign of the Sierra Club, based out of Harrisburg, where I will be focusing on coal issues in and around the Susquehanna River and Chesapeake Bay. I will miss my friends and colleagues at CCJ a great deal, and I will miss working with many of you as often as I have been fortunate enough to do so. Although I will no longer be on staff at CCJ, I remain committed to its mission, and to all of the great work we are doing. I wish I had the time to thank each of you individually. Please know that I appreciate all that you have given to CCJ during my time here.